Provides easy access to mats – quickly! The Mat Hive System Puts You in Control of Your Special Mats. The Mat Hive storage system, from MPT, combines the strength of the natural honey comb form with high-impact polystyrene to form a storage system that is stronger, longer lasting, and less costly than most conventional tubular mat storage products. The Mat Hive system takes the guess work out of finding your special mats when you need them. Storing these special mats on one specific shelf does help with the control process but it does not address the problem of finding a specific mat when you need it. The natural rotation of daily production almost assures the mat you want is on the bottom of the pile. The mat is difficult to extract and can be deformed from the weight of the other mats. Mat Hive carts are standardwith 33 or 66 storage cells. Fast access to mats – they slide in and out of the cell easily. Stores 30% to 40% more mats than round tube systems. 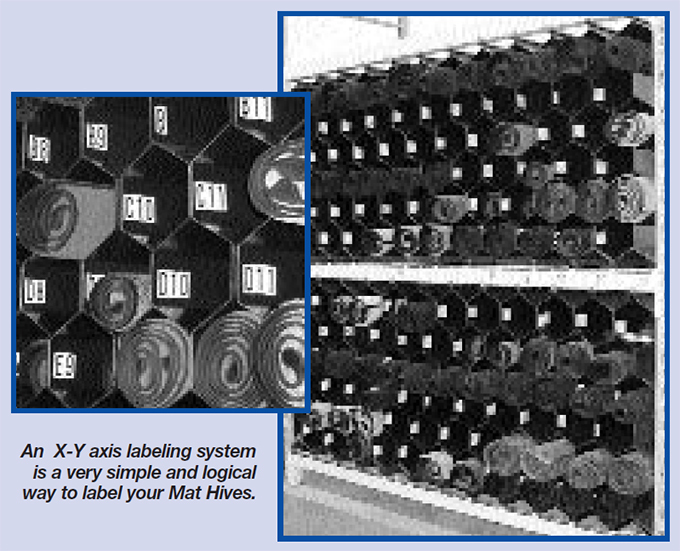 Mat Hive components were designed to be installed in standard pallet racking. It is available in movable, stackable carts to save on valuable floor space. The Mat Hive system accepts most standard width mats up to ten feet long. Take control of the storage and retrieval of your special mats. These days, more and more mats feature unique logos, colors or sizes. This creates a challenge for rental operations. You need a simple tracking system for mats so you can locate them quickly when route loads are being prepared. 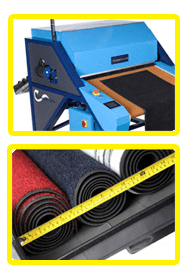 Since mats are rotated often, you want to ensure that you can find the mat you need when you need it – quickly! MPT can help you develop a simple identification system to locate specific mats and return them to the same cell after each use. To order your Mat Hive, follow these steps to determine the size you need. Measure the inside dimensions of your existing pallet rack. You can also get these dimensions from the supplier of your new rack. 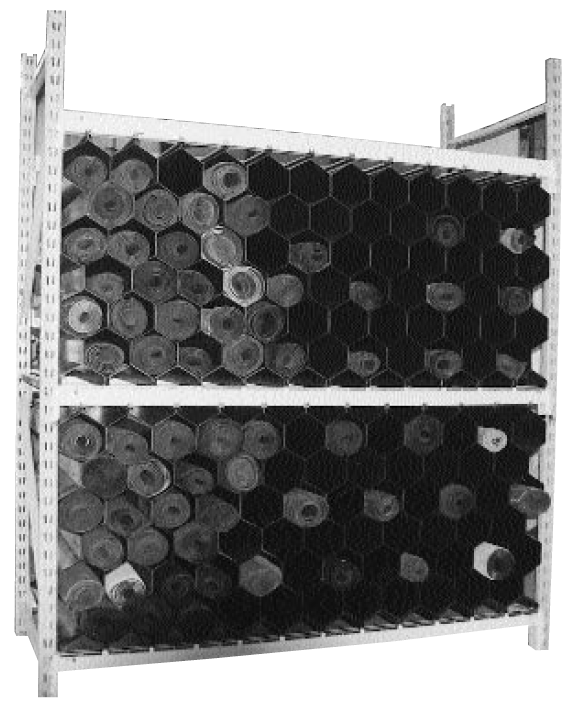 Use these guidelines for compatibility of the Mat Hive with your existing pallet racking. HEIGHT: The ideal height for the Mat Hive installation is 41 3/4″. It can fit between 41 1/2″ and 42″ as part of the normal installation. If you’re current pallet rack is outside this range, you will need to build up the base to meet these height ranges. Wood works well for this, if it is attached securely to the lower pallet rack rail. 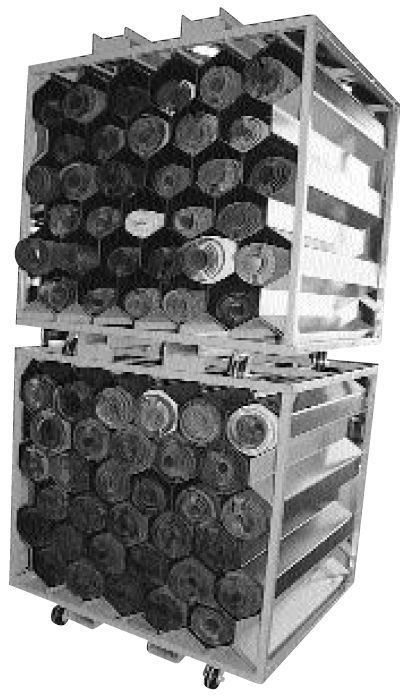 DEPTH: The depth of standard pallet racking, from front to back, varies considerably. PDPI needs an accurate measure of this depth in order to provide a good fit to the top channel and bottom support. This dimension should be determined before you plan to place your order. If the width of your shelf is 8 feet, 10 feet, or 12 feet, an even number of Mat Hive units will fill the area. If your shelf is not one of these three you may have to build a bulkhead or false wall to bring the width into an increment of 8 inches to complete the installation. The next step is to determine how many Mat Hive Units you will need for the space you have available. Remember that one Mat Hive Unit includes a top channel and a bottom support and one right hand and one left hand plastic panel. 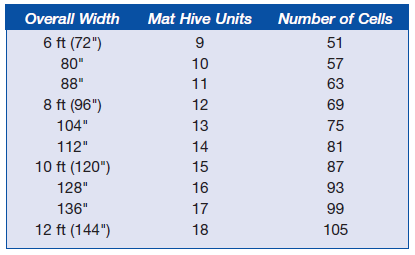 The table below will help you determine the proper number of Mat Hive Units and the resulting number of storage cells. Now you have all the information you need to order your Mat Hive System. You can place your order or get any remaining questions answered by calling 1-800-486-5249.